knowledge is rather limited, so this is why I need your help. at these funny looking hands? cut work petticoat and bloomers are in good condition. do appear too large for the body. In this picture she has on handsewn socks. I like to think this doll was lovingly made by a mother for her daughter. Can you imagine a child’s joy at receiving this wonderful gift? So charming. I love your sentiments, too. I hope the doll receives a loving home. That being said, I will say that 3 years ago, I went on a Christmas homes tour in Houston(actually it was in The Heights) and one of the homes was gorgeous (recently built) with a room devoted to dolls. This was showcase after showcase FILLED with really valuable antique dolls. The man in line man behind us said, "Reminds me of Chuckie — gives me the creeps." Now, for the rest of the story, last winter this over a million dollar home burned to the ground, killing both the owner (who was in a wheel chair) as well as her caretaker who had worked for her for many years. The story was on our local news & even was on the front of the Houston Chronicle. I felt that house had a really bad karma despite its beauty and I think it came from those dolls. All I know is she's before my day! My mom didn't really have toys, she said once she supposed she had a doll one time, so I imagine it would have been something like this handmade. Handmade is the only way to explain those hands huh? She is a dear, not creepy at all. her cloths could use a good wash and bleach job. I think she is divine. Richard from My Old Historic House. Sherry, it's been a while since I've dealt in antique dolls, but she appears to be a Minerva tin head doll from the late 1800s. They were made in Germany and quite popular. These were more indestructible than the china heads of the day and marketed as such for little girls to play with. It's possible that the body and clothing were handmade, but they were also commercially made, too. 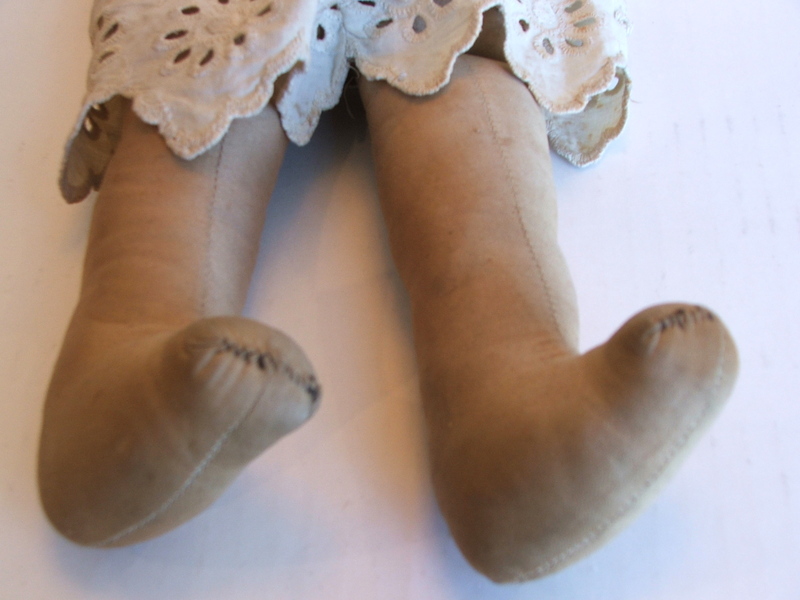 It was also common with this type of body to have sewn on socks or leather boots. The clothing certainly looks period and quite possibly original. If there is a number on the back of her shoulderplate this would correspond to her size. Do a search of "Minerva tin head" on ebay to see similar examples. I hope this helps. I can only make an educated guess without actually examining the doll in person. I used to have a collection of antique French and German bisque head/composition body dolls that also included china head and Parian examples. I got out of the doll business a few years ago and auctioned my entire collection off at Theriault's in Maryland. Very sweet Sherry and I like the thought of a mother making this for her daughter. Very sentimental! So sweet,and wouldn't it be awesome to know it's history. I love dolls especially babydoll ones. This would have been a to play with one, I think handmade in hard times for a child from her mother. I immediately thought she looked like a Minerva too. They usually have the name and number on the shoulder plate. I have one that my daughter found at a garage sale, several years ago. I just finished giving her a new body and have yet to make her some clothing. I haven't a clue about the price, however. 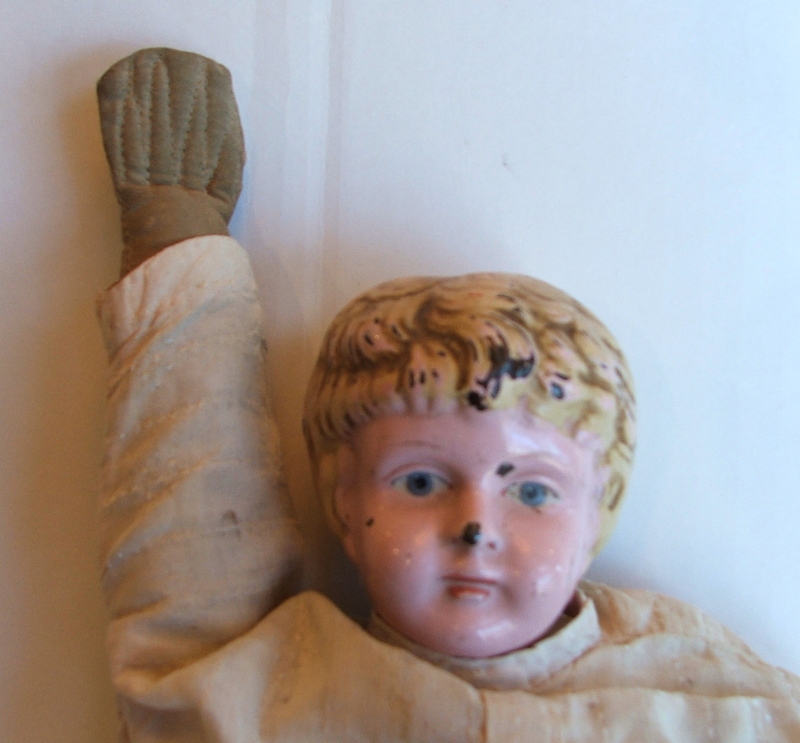 It looks like a German Minerva doll. 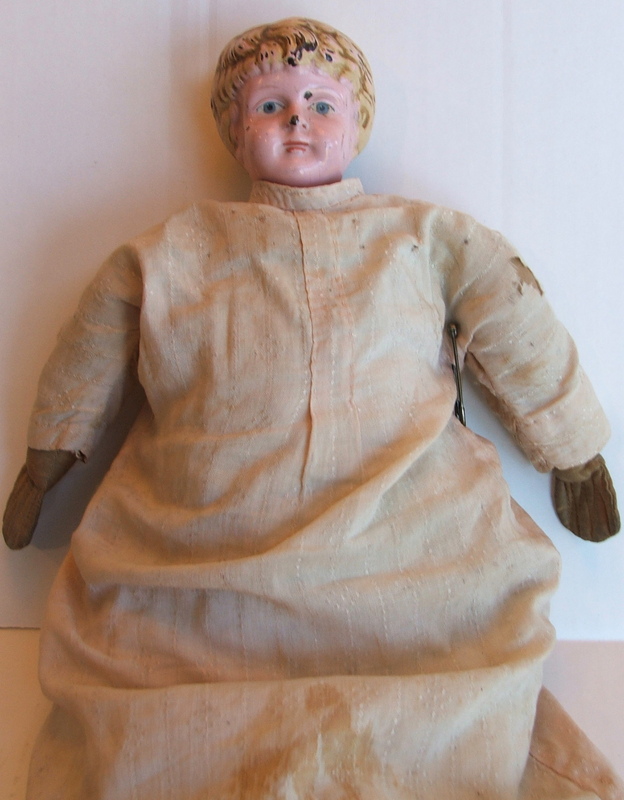 The easiest way to find out what you can actually expect to get for her is doing a search on ebay for tin head dolls. Then on the left side of the page, click on completed listings. This will give you a list of what was actually paid (price in green), plus those that didn't get any bids at all (price in red). Just looking at current listings only tells you what people THINK they should get, not what buyers will actually pay. Hope this helps! Sherry how wonderful. 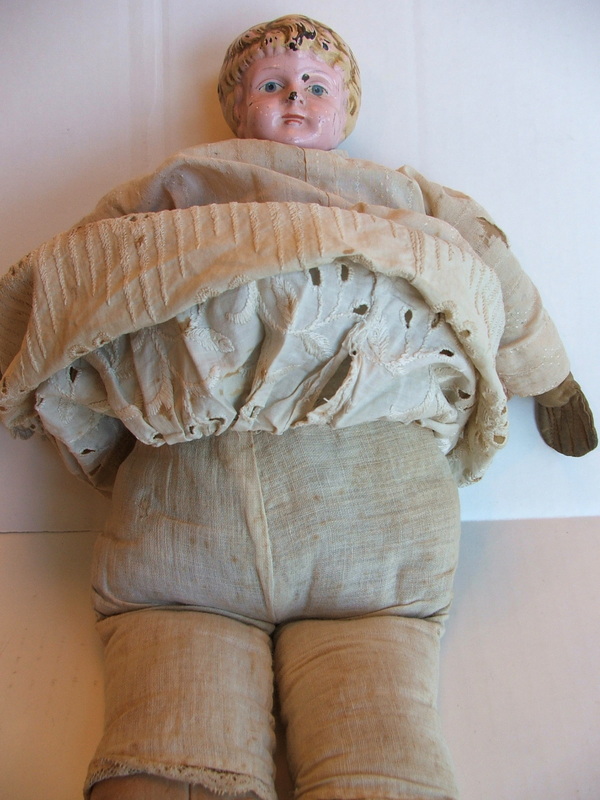 This looks like an special doll for an Antiques Roadshow expert to take a look at! She was surely a joy to someone, somewhere. Perhaps through you she will find a good home. She was loved. That much is certain! 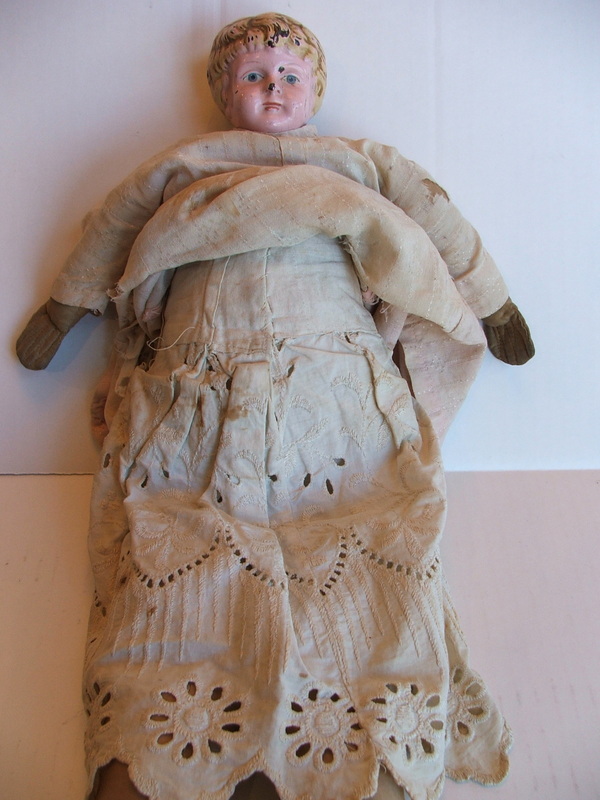 Sherry, this is so similar to my great-grandmother's doll that I have. 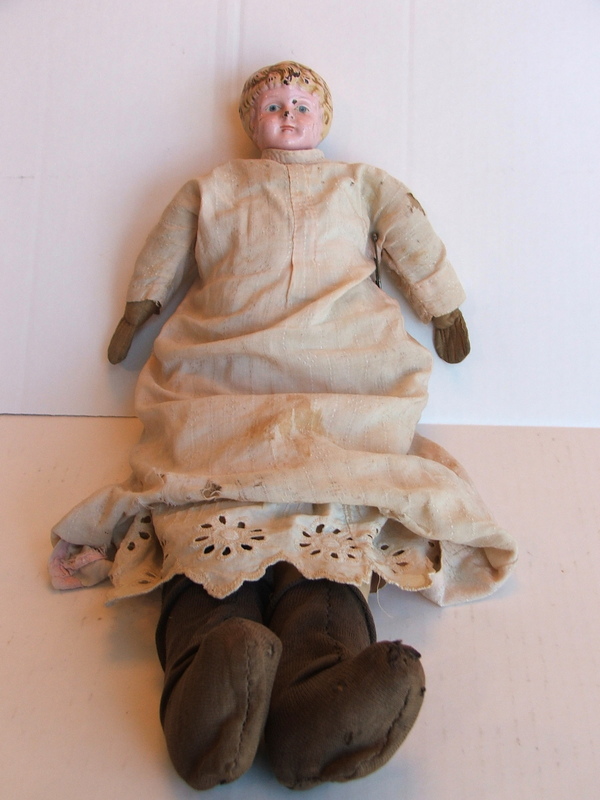 Her doll has leather hands,feet and a bisque head. It's dated to the 1800s. I love your doll! How neat! Thank you for sharing. Thank you for joining me at Home Sweet Home!